In March 2015, the Croatian government adopted the National Programme for Rare Diseases (2015-2020). The modest budget allocated to the national plan is mainly used to cover the costs of patient treatment, with only a small percentage dedicated to the activities of patient organisations. Since its adoption, the plan has had several major successes including the identification and appointment of nine Centres of Excellence for rare diseases (the criteria used are not specific to Rare Diseases: they predate the EUCERD criteria, and are applied to all Centres of Excellence in Croatia). Other important successes include the collection of data for a RD registry by the Croatian Institute of Public Health, and the creation of Orphanet Croatia. The National Plan is considering the adoption of OrphaCode alongside ICD 10 in the Croatian National Health System. Implementation of the Plan is overseen by a multistakeholder committee which meets regularly. There are currently no national or regional-level registries for rare diseases. The neonatal screening programme in Croatia tests newborns for two rare diseases; phenylketonuria and hypothyroidism. Croatia does not have a national policy for the development or implementation of Clinical Practice Guidelines (CPGs); however, there is a policy in place for the adoption of CPGs for rare disease at the national level. Croatia has numerous information resources, which provide information to rare disease patients and their carers. Both the national Orphanet team and the rare disease helpline, created through the National Alliance of Rare Disease Patient Organisations, provide extensive information and documentation and put patients in direct contact with medical professionals. Over the last few years, numerous meetings and symposiums have been organised (particularly around Rare Disease Day) to provide information to patients but to also bring rare diseases to the forefront of the public consciousness. Officially, 100 OMPs are available in Croatia – some measures exist to facilitate access for patients (e.g. ‘compassionate use’). *NB – The findings and conclusions in this report are those of the contributors and validating authorities, who are responsible for the contents; the findings and conclusions do not necessarily represent the views of the European Commission or national health authorities in Europe. 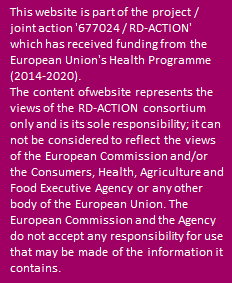 Therefore, no statement in this report should be construed as an official position of the European Commission or a national health authority.